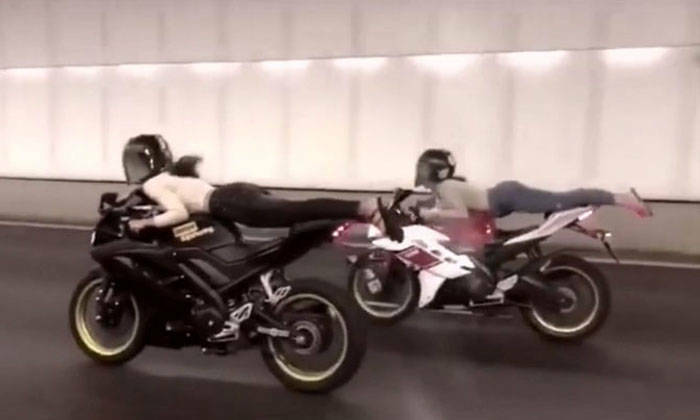 In the footage, two female motorcyclists can be seen lying stomach-down, with their legs stretched out horizontally, on their sports bikes to give the illusion of flying as they ride the bikes in what has been described as a “Superman stunt” online. Habis…Liao summons coming & license ??? u call that fun ?? They look so graceful. Wonder woman and Bat Girl. Wow!!!! Got other performance or not? Look its a bird!..no its a plane! no ..its the bodoh girls! Spore has lost control of the younger generation who taking the motivation from foreigners getting away lightly with crimes.